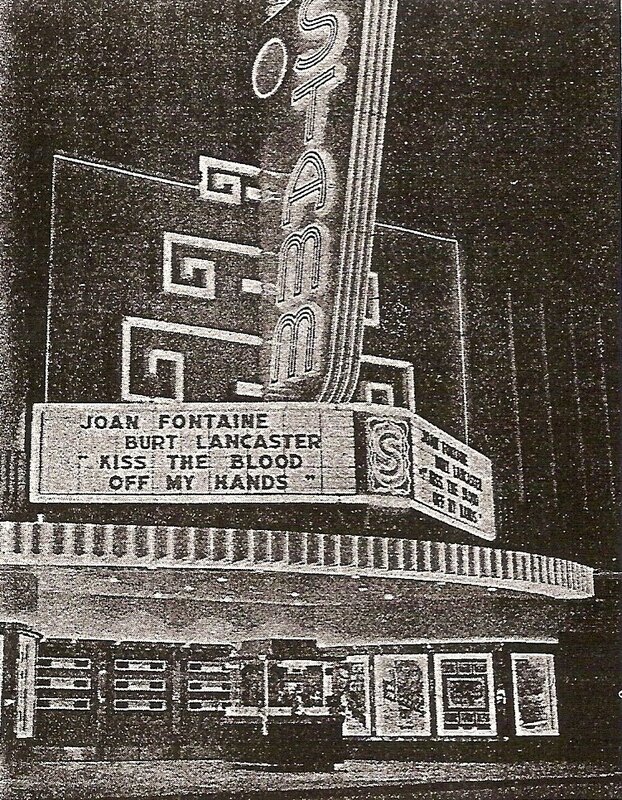 My friend John McElwee over at Greenbriar Picture Shows, in his current post on John Ford’s Stagecoach, mentions (as he often does, with clear affection) his hometown Liberty Theatre, which ran Stagecoach in April 1939 and is still showing movies today. He doesn’t know how I envy him, having a childhood movie haunt still around to revisit and savor. Of all the movie theaters I frequented in the first thirty years of my life, I can count on the fingers of one hand the ones that are currently in operation — and I’d still have at least a thumb and pinkie left over. 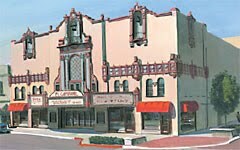 First and rosiest among these memories, my childhood home-away-from-home, was the Stamm Theatre in Antioch, Calif., a small town nestled in the hills of Contra Costa County about 40 miles east of San Francisco. Antioch is a lot bigger now, and has overrun many of those hills, but in the 1950s the population hovered just under 20,000 and the Stamm was the movie house of choice. The Stamm’s Moderne marquee tower, shown here in a recent photo, still stands, its futuristic spire looking like the nose of a Flash Gordon rocket ship pointed at the stars — albeit with the original colors (which I remember as red, chartreuse, dark green and gold) muted to a conservative gray and white. It was once a landmark in town, especially at night in its mostly residential neighborhood, and it adorned the Stamm’s daily ads in the Antioch Ledger. The Stamm was where I’d rather be most of the time. One Sunday in 1959, I passed up my first chance at an airplane ride; my father had chartered a small private plane to take the family on a fly-around of the county, but I preferred to spend the afternoon at the Stamm watching Ingrid Bergman in The Inn of the Sixth Happiness. There was another, older theater in town, the El Campanil, opened in 1928 as a combination vaudeville and moving picture house, shown here in a postcard image from the 1930s. By the 1950s the El Campanil was open only intermittently, alternating movies with live performances by local community theater companies (I saw my father perform there in Curse You, Jack Dalton and You Can’t Take It with You) and other performing groups; my dance teacher held her annual student recitals there, and I first performed on the El Campanil stage at age seven, tapdancing to “You’re a Grand Old Flag” in a red-and-blue sateen toy-soldier uniform. As for movies, my mother and uncle took me there to see a reissue of Snow White and the Seven Dwarfs (on a double bill with, of all things, Abbott and Costello in Buck Privates), and I remember attending the occasional Saturday kiddie matinee there. But most of the time, Saturday afternoons or not, it was the Stamm. It was movies all year round there, and the house itself was — at least to my young eyes — homier and more welcoming than the Spanish-themed, cavernous and rather forbidding El Campanil. I wish I could give you some illustrations of the Stamm’s warm red-and-green interior, but the Stamm family seems to have neglected to photograph it before the building was gutted to the bare concrete walls in the late 1990s. All I have are some copies-of-copies provided to me by the Theatre Historical Society of America (THSA) in Elmhurst, Ill. (click the link to visit their Web site and learn of their worthy mission) of an article that appeared in the “Better Theatres” section of Motion Picture Herald on February 5, 1949, as the Stamm was first opening for business. UPDATE NO. 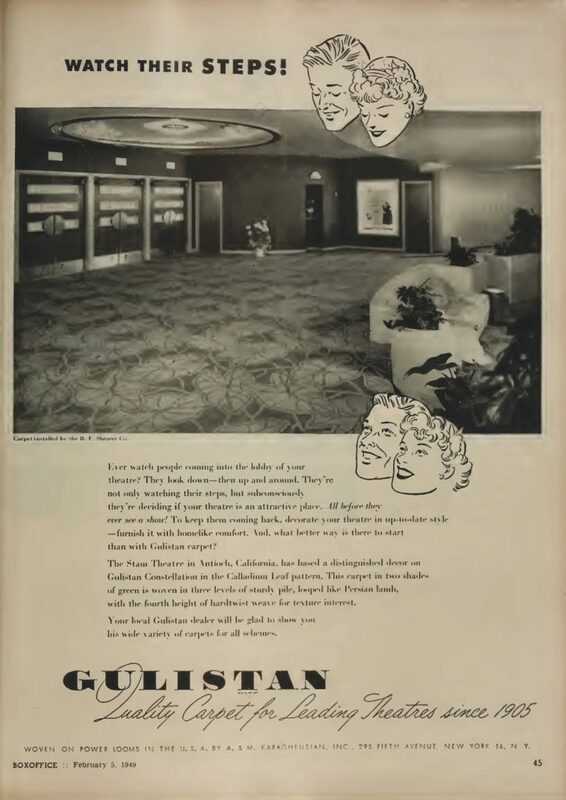 2, 3/18/14: Joe Vogel of Cinema Treasures has kindly shared a repaired link to that Gulistan carpets ad; the ad can now be seen here as part of an online archival copy of that issue of Box Office. But better than that, now I’m able to reproduce the ad, and here it is. As I said, the carpet is two-tone green, the doors red with brass handles and baseboards and milk-glass window slits. The far wall is also red, the ceiling and sofa ivory-colored, as is the far wall leading off to the auditorium. 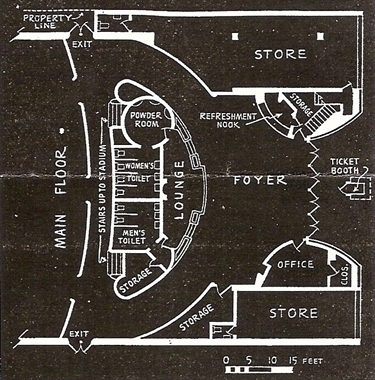 Compare this picture of the lobby with the copy of the floorplan below and you have a pretty clear idea of the layout. And check out that sofa! In those days, most of my friends and I wished our living rooms were this comfy. Not that we spent much time in the lobby or the lounge. 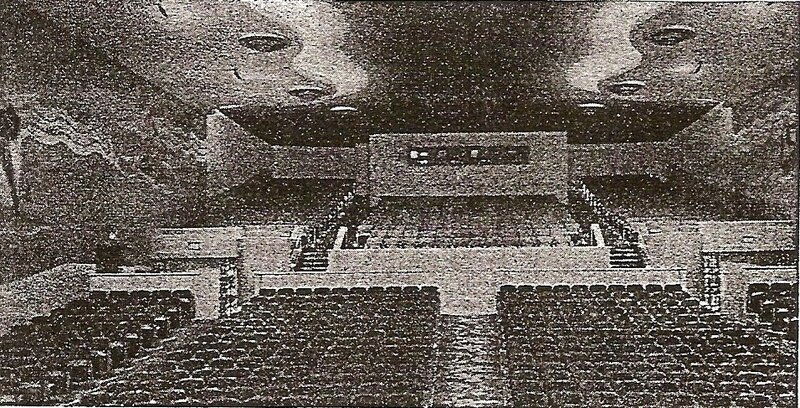 The main attraction, naturally, was the auditorium, divided between a main floor of about 900 seats and a loge section seating another 208, where for an extra 25 cents over the regular adult admission you could sit in raked stadium seating in plush rocking-chair comfort. Since a child admission was only a quarter, my brother and I naturally preferred to rough it in the regular chairs down below — we were only kids and those seats were plenty big enough for us and closer to the screen. Besides, we had other things (like popcorn, candy and sodas) to spend the extra money on. 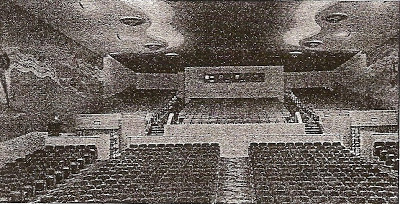 Here are two views of the Stamm’s auditorium, first from the stage looking back, then (below) from the back looking at the screen. You can just glimpse the Rockwell Kent-style murals on the walls of fishermen casting nets, farmers sowing seeds, and women at flowing Art Moderne wells. They were lit by ultraviolet sidelights that gave them (and the teeth and clothes of people in the audience) an eerie blue glow. 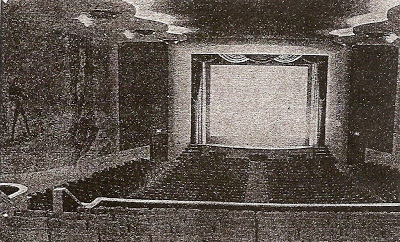 By the time I came along, the Stamm had converted to Cinemascope, so the proscenium and screen I knew were much wider than in this picture from 1949. Still, the house looks much as I remember it. If I squint very hard and jam my imagination into Warp Eight, I can almost believe I see the little hole in the center of the stage through which a microphone would rise whenever Mr. Stamm wanted to stalk out and tell us we were making too much noise, and if we didn’t quiet down like nice little ladies and gentlemen, he’d turn off the movie and make us all go home. I have one more memento of the Stamm Theatre, shared with me by the artist, Gary Lee Parks of the THSA, and used here by permission. When Mr. Parks’s request to photograph the Stamm’s alfresco paintings was refused by the Stamm family, he did the next best thing. 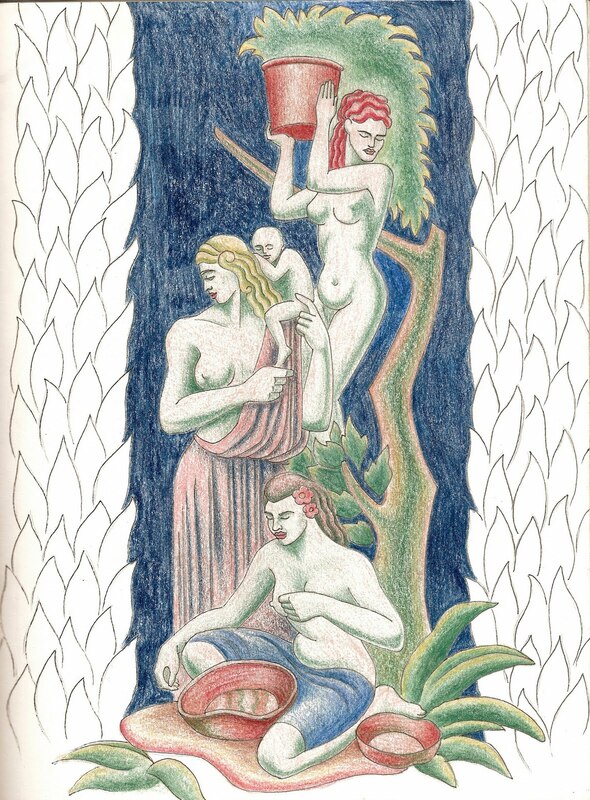 He bought an admission ticket, then sat in the audience with his sketchbook and pencil and copied one of the paintings in black and white, making color notes, which he turned into a full-color rendering as soon as he got home. (The movie he sat through, by the way, was The Coneheads; such dedication!) This painting can just barely be discerned as a dim smudge on the left side of the view above, the one facing the screen. I can vouch that Mr. Parks’s recreation is accurate; this painting remains particularly well-remembered by me — for obvious reasons (this was, after all, the 1950s). 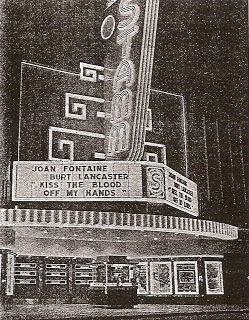 To tell the truth, the recollection of this picture glowing in the unearthly blacklight of that auditorium may have almost as much to do with my vivid memories of the Stamm as the movies I saw there. The Stamm is gone now — all but that looming facade — converted wall-to-wall into an Apostolic church. Paradoxically, the El Campanil survives virtually intact, a multi-use performing arts center (just as it was 50-plus years ago) saved from the wrecking ball by a citizens’ preservation drive in 2003. 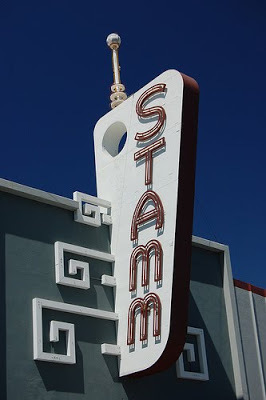 Not enough people cared to preserve the Stamm, evidently; it was doomed, no doubt, by its late-’40s movies-only design. But in its day — and probably for some time after its day had passed — it was where you went if you wanted to see a movie anywhere around Antioch. 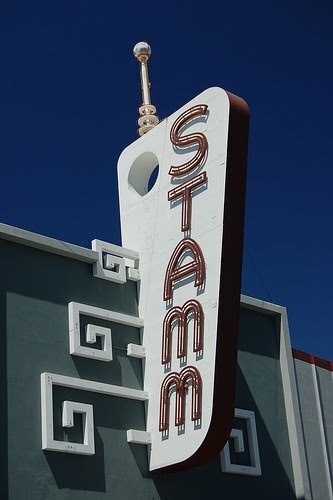 I work about 2 minutes away from the Stamm and also was a regular when i was a kid, even saw Empire Strikes Back here! Great memories. When it was converted to a "church" I was heartbroken, and the mystique of this place still looms heavy in my imagination. If it is true that they gutted the inside (which I don't doubt), its a damn shame. I recently went down to the church and asked to look inside, stating that I just wanted to take a look for old times sake, and they refused me entry. Will post again if I can dig up more info…AND hopefully pictures. Yes, Dave, it's true: gutted to the bare concrete walls; I saw it with my own teary eyes in 1999 or so. Worse yet, the Stamm family refused permission to photograph the interior beforehand. Their dog-in-the-manger attitude baffles me. But then, my father had dealings with George Stamm in the 1950s, and his memories of the man were not fond. And by the way, Dave: If you do manage to track down any pictures, especially of the interior, that you're able to share, I'll be happy to post them here! I was an usherette at both the El Campaniel and the "New" Stamm Theater. Am surprized that the "Stamm"m no longer remains. Jiggs Del Coletti was the manager at both theaters when I worked there. Jim, email me at dave@adventureamigos.net if you can, I run a movie website and we do live radio shows. I think a show about the stamm and other antioch theaters would be a blast! Let me know if you're interested. BTW, I still cannot get into the Stamm!